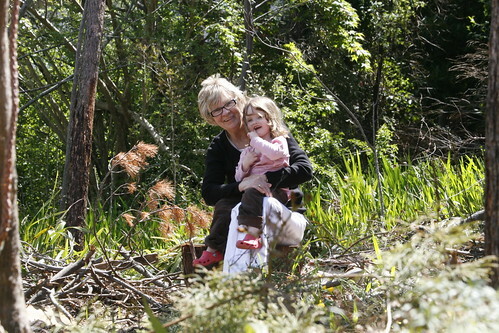 Grandma and Nina in the garden, a photo by Mistress B on Flickr. Last time Pam and Keith Robinson saw Nina in the flesh, she was just six months old, while Pascal wasn't even a twinkle in his daddy's eye. So there was plenty of catching up to do when they visited this time, and all parties made the most of it! We've had a lovely nearly-four weeks with Pam and Keith staying at Casa Noginson, spoiling Nina and Pascal to within an inch of their lives, and generally making themselves incredibly useful around the house by tackling all those jobs that Phil and I just can't seem to find time to do. The bathroom has finally had the finishing paint touches put on, the lounge room has been repainted, the garden is looking better than ever, and now that they've departed back to the UK, we face the unwelcome prospect of doing the washing up ourselves for the first time in weeks. Nina loved having her 'gamma and gamma' around, and had them jumping through all sorts of hoops. I'm not sure Keith's legs will ever be the same after running up and down a strip of bubble wrap for Nina's amusement ("Again, Grandad! Again!). And Pascal was never short of someone to cuddle or feed him, so he was happy as a pig in mud.